Craving those minty cookies that all the girls are selling right now? It’s hard to say no to those cute faces, especially when the cookies are so delicious. 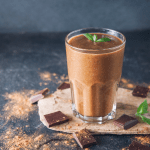 But this chocolate mint Shakeology will sure help curb the cravings! Learn more about Shakeology and why I drink it every day. Want to get your daily dose of superfood? Order your Shakeology here.